This article contains Ogham text. Without proper rendering support, you may see question marks, boxes, or other symbols instead of Ogham letters. Ogham (/ˈɒɡəm/; Modern Irish [ˈoːmˠ] or [ˈoːəmˠ]; Old Irish: ogam [ˈɔɣamˠ]) is an Early Medieval alphabet used to write the early Irish language (in the "orthodox" inscriptions, 1st to 6th centuries AD), and later the Old Irish language (scholastic ogham, 6th to 9th centuries). There are roughly 400 surviving orthodox inscriptions on stone monuments throughout Ireland and western Britain; the bulk of which are in southern Munster. The largest number outside Ireland are in Pembrokeshire, Wales. According to the High Medieval Bríatharogam, names of various trees can be ascribed to individual letters. The etymology of the word ogam or ogham remains unclear. One possible origin is from the Irish og-úaim 'point-seam', referring to the seam made by the point of a sharp weapon. It has been argued that the earliest inscriptions in ogham date to about the 4th century AD, but James Carney believed its origin is rather within the 1st century BC. Although the use of "classical" ogham in stone inscriptions seems to have flowered in the 5th and 6th centuries around the Irish Sea, from the phonological evidence it is clear that the alphabet predates the 5th century. A period of writing on wood or other perishable material prior to the preserved monumental inscriptions needs to be assumed, sufficient for the loss of the phonemes represented by úath ("H") and straif ("Z" in the manuscript tradition, but probably "F" from "SW"), gétal (representing the velar nasal "NG" in the manuscript tradition, but etymologically probably "GW"), all of which are clearly part of the system, but unattested in inscriptions. It appears that the ogham alphabet arose from another script, and some even consider it a mere cipher of its template script (Düwel 1968: points out similarity with ciphers of Germanic runes). The largest number of scholars favours the Latin alphabet as this template, although the Elder Futhark and even the Greek alphabet have their supporters. Runic origin would elegantly explain the presence of "H" and "Z" letters unused in Irish, as well as the presence of vocalic and consonantal variants "U" vs. "W", unknown to Latin writing and lost in Greek (cf. digamma). The Latin alphabet is the primary contender mainly because its influence at the required period (4th century) is most easily established, being widely used in neighbouring Roman Britannia, while the runes in the 4th century were not very widespread even in continental Europe. In Ireland and in Wales, the language of the monumental stone inscriptions is termed Primitive Irish. The transition to Old Irish, the language of the earliest sources in the Latin alphabet, takes place in about the 6th century. Since ogham inscriptions consist almost exclusively of personal names and marks possibly indicating land ownership, linguistic information that may be glimpsed from the Primitive Irish period is mostly restricted to phonological developments. There are two main schools of thought among scholars as to the motivation for the creation of ogham. Scholars such as Carney and MacNeill have suggested that ogham was first created as a cryptic alphabet, designed by the Irish so as not to be understood by those with a knowledge of the Latin alphabet. In this school of thought, it is asserted that "the alphabet was created by Irish scholars or druids for political, military or religious reasons to provide a secret means of communication in opposition to the authorities of Roman Britain." The Roman Empire, which then ruled over neighbouring southern Britain, represented a very real threat of invasion to Ireland, which may have acted as a spur to the creation of the alphabet. Alternatively, in later centuries when the threat of invasion had receded and the Irish were themselves invading the western parts of Britain, the desire to keep communications secret from Romans or Romanised Britons would still have provided an incentive. With bilingual ogham and Latin inscriptions in Wales, however, one would suppose that the ogham could easily be decoded by anyone in the Post-Roman world. The second main school of thought, put forward by scholars such as McManus, is that ogham was invented by the first Christian communities in early Ireland, out of a desire to have a unique alphabet for writing short messages and inscriptions in the Irish language. The argument is that the sounds of Primitive Irish were regarded as difficult to transcribe into the Latin alphabet, so the invention of a separate alphabet was deemed appropriate. A possible such origin, as suggested by McManus (1991:41), is the early Christian community known to have existed in Ireland from around AD 400 at the latest, the existence of which is attested by the mission of Palladius by Pope Celestine I in AD 431. A variation is that the alphabet was first invented, for whatever reason, in 4th-century Irish settlements in west Wales after contact and intermarriage with Romanised Britons with a knowledge of the Latin alphabet. In fact, several ogham stones in Wales are bilingual, containing both Irish and British Latin, testifying to the international contacts that led to the existence of some of these stones. A third theory put forward by the noted ogham scholar R. A. S. Macalister was influential at one time, but finds little favour with scholars today. Macalister believed that ogham was first invented in Cisalpine Gaul around 600 BC by Gaulish druids as a secret system of hand signals, and was inspired by a form of the Greek alphabet current in Northern Italy at the time. According to this theory, the alphabet was transmitted in oral form or on wood only, until it was finally put into a written form on stone inscriptions in early Christian Ireland. Later scholars are largely united in rejecting this theory, however, primarily because a detailed study of the letters shows that they were created specifically for the Primitive Irish of the early centuries AD. The supposed links with the form of the Greek alphabet that Macalister proposed can also be disproved. Macalister's theory of hand or finger signals as a source for ogham is a reflection of the fact that the signary consists of four groups of five letters, with a sequence of strokes from one to five. A theory popular among modern scholars is that the forms of the letters derive from the various numerical tally-mark systems in existence at the time. This theory was first suggested by the scholars Rudolf Thurneysen and Joseph Vendryes, who proposed that the ogham script was inspired by a pre-existing system of counting based around the numbers five and twenty, which was then adapted to an alphabet form by the first ogamists. 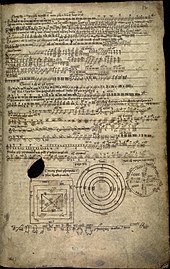 According to the 11th-century Lebor Gabála Érenn, the 14th-century Auraicept na n-Éces, and other Medieval Irish folklore, ogham was first invented soon after the fall of the Tower of Babel, along with the Gaelic language, by the legendary Scythian king, Fenius Farsa. According to the Auraicept, Fenius journeyed from Scythia together with Goídel mac Ethéoir, Íar mac Nema and a retinue of 72 scholars. They came to the plain of Shinar to study the confused languages at Nimrod's tower (the Tower of Babel). Finding that they had already been dispersed, Fenius sent his scholars to study them, staying at the tower, co-ordinating the effort. After ten years, the investigations were complete, and Fenius created in Bérla tóbaide "the selected language", taking the best of each of the confused tongues, which he called Goídelc, Goidelic, after Goídel mac Ethéoir. He also created extensions of Goídelc, called Bérla Féne, after himself, Íarmberla, after Íar mac Nema, and others, and the Beithe-luis-nuin (the ogham) as a perfected writing system for his languages. The names he gave to the letters were those of his 25 best scholars. Alternatively, the Ogam Tract credits Ogma mac Elathan (Ogmios) with the script's invention. Ogma was skilled in speech and poetry, and created the system for the learned, to the exclusion of rustics and fools. The first message written in ogam were seven b's on a birch, sent as a warning to Lug mac Elathan, meaning: "your wife will be carried away seven times to the otherworld unless the birch protects her". For this reason, the letter b is said to be named after the birch, and In Lebor Ogaim goes on to tell the tradition that all letters were named after trees, a claim also referred to by the Auraicept as an alternative to the naming after Fenius' disciples. Strictly speaking, the word ogham refers only to the form of letters or script, while the letters themselves are known collectively as the Beith-luis-nin after the letter names of the first letters (in the same manner as the modern "Alphabet" deriving from the Greek Alpha and Beta). The fact that the order of the letters is in fact BLFSN led the scholar Macalister to propose that the letter order was originally BLNFS. This was to fit into his own theories which linked the Beith-luis-nin to a form of the Greek alphabet current in Northern Italy in the 6th and 5th centuries BC. However, there is no evidence for Macalister's theories, and they have since been discounted by later scholars. There are in fact other explanations for the name Beith-luis-nin. One explanation is that the word nin which literally means 'a forked branch' was also regularly used to mean a written letter in general. Beith-luis-nin could therefore mean simply 'Beith-luis letters'. The other explanation is that Beith-luis-nin is a convenient contraction of the first five letters thus: Beith-LVS-nin. The ogham alphabet originally consisted of twenty distinct characters (feda), arranged in four series aicmí (plural of aicme "family"; compare aett). Each aicme was named after its first character (Aicme Beithe, Aicme hÚatha, Aicme Muine, Aicme Ailme, "the B Group", "the H Group", "the M Group", "the A Group"). Five additional letters were later introduced (mainly in the manuscript tradition), the so-called forfeda. The Ogam Tract also gives a variety of some 100 variant or secret modes of writing ogham (92 in the Book of Ballymote), for example the "shield ogham" (ogam airenach, nr. 73). Even the Younger Futhark are introduced as a kind of "Viking ogham" (nrs. 91, 92). The twenty standard letters of the Ogham alphabet and the five forfeda. The box on the left shows the consonants, and the box on the right shows the vowels (both non-IPA). The letter labelled IA (Ifín) earlier had the value of p. An additional (secondary) letter p is shown as 26th character (peith). This is the vertical writing of Ogham; in the horizontal form, the right side would face downward. Z straif [sw] or [ts]? A letter for p is conspicuously absent, since the phoneme was lost in Proto-Celtic, and the gap was not filled in Q-Celtic, and no sign was needed before loanwords from Latin containing p appeared in Irish (e.g., Patrick). Conversely, there is a letter for the labiovelar q (ᚊ ceirt), a phoneme lost in Old Irish. The base alphabet is therefore, as it were, designed for Proto-Q-Celtic. Of the five forfeda or supplementary letters, only the first, ébad, regularly appears in inscriptions, but mostly with the value K (McManus, § 5.3, 1991). The others, except for emancholl, have at most only one certain 'orthodox' (see below) inscription each. Due to their limited practical use, later ogamists turned the supplementary letters into a series of diphthongs, changing completely the values for pín and emancholl. This meant that the alphabet was once again without a letter for the P sound, forcing the invention of the letter peithboc (soft 'B'), which appears in the manuscripts only. The letter names are interpreted as names of trees or shrubs in manuscript tradition, both in Auraicept na n-Éces ('The Scholars' Primer') and In Lebor Ogaim ('The Ogam Tract'). They were first discussed in modern times by Ruaidhrí Ó Flaithbheartaigh (1685), who took them at face value. The Auraicept itself is aware that not all names are known tree names, saying "Now all these are wood names such as are found in the Ogham Book of Woods, and are not derived from men", admitting that "some of these trees are not known today". The Auraicept gives a short phrase or kenning for each letter, known as a Bríatharogam, that traditionally accompanied each letter name, and a further gloss explaining their meanings and identifying the tree or plant linked to each letter. Only five of the twenty primary letters have tree names that the Auraicept considers comprehensible without further glosses, namely beith "birch", fearn "alder", saille "willow", duir "oak" and coll "hazel". All the other names have to be glossed or "translated". According to the leading modern ogham scholar, Damian McManus, the "Tree Alphabet" idea dates to the Old Irish period (say, 10th century), but it post-dates the Primitive Irish period, or at least the time when the letters were originally named. Its origin is probably due to the letters themselves being called feda "trees", or nin "forking branches" due to their shape. Since a few of the letters were, in fact, named after trees, the interpretation arose that they were called feda because of that. Some of the other letter names had fallen out of use as independent words, and were thus free to be claimed as "Old Gaelic" tree names, while others (such as ruis, úath or gort) were more or less forcefully re-interpreted as epithets of trees by the medieval glossators. McManus (1991, §3.15) discusses possible etymologies of all the letter names, and as well as the five mentioned above, he adds one other definite tree name: onn "ash" (the Auraicept wrongly has furze). McManus (1988, p. 164) also believes that the name Idad is probably an artificial form of Iubhar or yew, as the kennings support that meaning, and concedes that Ailm may possibly mean "pine tree" as it appears to be used to mean that in an 8th-century poem. Thus out of twenty letter names, only eight at most are the names of trees. The other names have a variety of meanings, which are set out in the list below. Beith, Old Irish Beithe means "birch-tree", cognate to Middle Welsh bedw. Latin betula is considered a borrowing from the Gaulish cognate. Luis, Old Irish Luis is either related to luise "blaze" or lus "herb". The arboreal tradition has caertheand "rowan". Fearn, Old Irish Fern means "alder-tree", Primitive Irish *wernā, so that the original value of the letter was [w]. Sail, Old Irish Sail means "willow-tree", cognate to Latin salix. Nion, Old Irish Nin means either "fork" or "loft". The arboreal tradition has uinnius "ash-tree". Uath, Old Irish Úath means úath "horror, fear", the arboreal tradition has "white-thorn". The original etymology of the name, and the letter's value, are however unclear. McManus (1986) suggested a value [y]. Peter Schrijver (see McManus 1991:37) suggested that if úath "fear" is cognate with Latin pavere, a trace of PIE *p might have survived into Primitive Irish, but there is no independent evidence for this. Dair, Old Irish Dair means "oak" (PIE *doru-). Tinne, Old Irish Tinne from the evidence of the kennings means "bar of metal, ingot". The arboreal tradition has cuileand "holly". Coll, Old Irish Coll meant "hazel-tree", cognate with Welsh collen, correctly glossed as cainfidh "fair-wood" ("hazel") by the arboreal interpretation. Latin corulus or corylus is cognate. Ceirt, Old Irish Cert is cognate with Welsh perth "bush", Latin quercus "oak" (PIE *perkwos). It was confused with Old Irish ceirt "rag", reflected in the kennings. The Auraicept glosses aball "apple". Muin, Old Irish Muin: the kennings connect this name to three different words, muin "neck, upper part of the back", muin "wile, ruse", and muin "love, esteem". The arboreal tradition has finemhain "vine". Gort, Old Irish Gort means "field" (cognate to garden). The arboreal tradition has edind "ivy". nGéadal, Old Irish Gétal from the kennings has a meaning of "killing", maybe cognate to gonid "slays", from PIE gwen-. The value of the letter in Primitive Irish, then, was a voiced labiovelar, [ɡʷ]. The arboreal tradition glosses cilcach, "broom" or "fern". Straif, Old Irish Straiph means "sulphur". The Primitive Irish letter value is uncertain, it may have been a sibilant different from s, which is taken by sail, maybe a reflex of /st/ or /sw/. The arboreal tradition glosses draighin "blackthorn". Ruis, Old Irish Ruis means "red" or "redness", glossed as trom "elder". Ailm, Old Irish Ailm is of uncertain meaning, possibly "pine-tree". The Auraicept has crand giuis .i. ochtach, "fir-tree" or "pinetree". Onn, Old Irish Onn means "ash-tree", although the Auraicept glosses aiten "furze". Úr, Old Irish Úr, based on the kennings, means "earth, clay, soil". The Auraicept glosses fraech "heath". Eadhadh, Old Irish Edad of unknown meaning. The Auraicept glosses crand fir no crithach "test-tree or aspen"
Iodhadh, Old Irish Idad is of uncertain meaning, but is probably a form of ibhar "yew", which is the meaning given to it in the arboreal tradition. Ór, "gold" (from Latin aurum); the arboreal tradition has feorus no edind, "spindle tree or ivy"
Uilleann, Old Irish Uilleand "elbow"; the arboreal tradition has edleand "honeysuckle"
Pín, later Ifín, Old Irish Iphin with spinan no ispin "gooseberry or thorn". 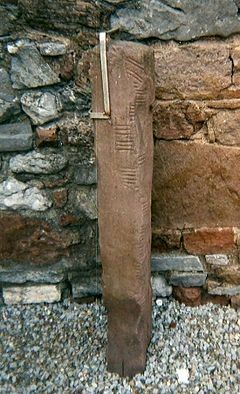 Ogham stone from the Isle of Man showing the droim in centre. Text reads BIVAIDONAS MAQI MUCOI CUNAVA[LI], or in English, "Of Bivaidonas, son of the tribe Cunava[li]". Monumental ogham inscriptions are found in Ireland and Wales, with a few additional specimens found in southwest England (Devon and Cornwall), the Isle of Man, and Scotland, including Shetland and a single example from Silchester in England. They were mainly employed as territorial markers and memorials (grave stones). The stone commemorating Vortiporius, a 6th-century king of Dyfed (originally located in Clynderwen), is the only ogham stone inscription that bears the name of an identifiable individual. The language of the inscriptions is predominantly Primitive Irish; the few inscriptions in Scotland, such as the Lunnasting stone, record fragments of what is probably the Pictish language. The more ancient examples are standing stones, where the script was carved into the edge (droim or faobhar) of the stone, which formed the stemline against which individual characters are cut. The text of these "Orthodox Ogham" inscriptions is read beginning from the bottom left-hand side of a stone, continuing upward along the edge, across the top and down the right-hand side (in the case of long inscriptions). Roughly 380 inscriptions are known in total (a number, incidentally, very close to the number of known inscriptions in the contemporary Elder Futhark), of which the highest concentration by far is found in the southwestern Irish province of Munster. Over one third of the total are found in County Kerry alone, most densely in the former kingdom of the Corcu Duibne. Later inscriptions are known as "scholastic", and are post 6th century in date. The term 'scholastic' derives from the fact that the inscriptions are believed to have been inspired by the manuscript sources, instead of being continuations of the original monument tradition. Unlike orthodox ogham, some mediæval inscriptions feature all five Forfeda. Scholastic inscriptions are written on stemlines cut into the face of the stone, instead of along its edge. Ogham was also occasionally used for notes in manuscripts down to the 16th century. A modern ogham inscription is found on a gravestone dating to 1802 in Ahenny, County Tipperary. In Scotland, a number of inscriptions using the ogham writing system are known, but their language is still the subject of debate. It has been argued by Richard Cox in The Language of Ogham Inscriptions in Scotland (1999) that the language of these is Old Norse, but others remain unconvinced by this analysis, and regard the stones as being Pictish in origin. However, due to the lack of knowledge about the Picts, the inscriptions remain undeciphered, their language possibly being non-Indo-European. The Pictish inscriptions are scholastic, and are believed to have been inspired by the manuscript tradition brought into Scotland by Gaelic settlers. A rare example of a Christianised Ogham stone can be seen in St. Mary's Collegiate Church Gowran, County Kilkenny. As well as its use for monumental inscriptions, the evidence from early Irish sagas and legends indicates that ogham was used for short messages on wood or metal, either to relay messages or to denote ownership of the object inscribed. Some of these messages seem to have been cryptic in nature and some were also for magical purposes. In addition, there is evidence from sources such as In Lebor Ogaim, or the Ogham Tract, that ogham may have been used to keep records or lists, such as genealogies and numerical tallies of property and business transactions. There is also evidence that ogham may have been used as a system of finger or hand signals. In later centuries when ogham ceased to be used as a practical alphabet, it retained its place in the learning of Gaelic scholars and poets as the basis of grammar and the rules of poetry. Indeed, until modern times the Latin alphabet in Gaelic continued to be taught using letter names borrowed from the Beith-Luis-Nin, along with the Medieval association of each letter with a different tree. Ogham was added to the Unicode Standard in September 1999 with the release of version 3.0. The spelling of the names given is a standardisation dating to 1997, used in Unicode Standard and in Irish Standard 434:1999. The Unicode block for ogham is U+1680–U+169F. Modern New Age and Neopagan approaches to ogham largely derive from the now-discredited theories of Robert Graves in his book The White Goddess. In this work, Graves took his inspiration from the theories of the ogham scholar R. A. S. Macalister (see above) and elaborated on them much further. Graves proposed that the ogham alphabet encoded a set of beliefs originating in the Middle East in Stone Age times, concerning the ceremonies surrounding the worship of the Moon goddess in her various forms. Graves' argument is extremely complex, but in essence he argues that the Hebrews, Greeks and Celts were all influenced by a people originating in the Aegean, called 'the people of the sea' by the Egyptians, who spread out around Europe in the 2nd millennium BC, taking their religious beliefs with them. At some early stage these teachings were encoded in alphabet form by poets to pass on their worship of the goddess (as the muse and inspiration of all poets) in a secret fashion, understandable only to initiates. Eventually, via the druids of Gaul, this knowledge was passed on to the poets of early Ireland and Wales. Graves therefore looked at the Tree Alphabet tradition surrounding ogham and explored the tree folklore of each of the letter names, proposing that the order of the letters formed an ancient "seasonal calendar of tree magic". Although his theories have been disregarded by modern scholars (including Macalister himself, with whom Graves corresponded), they have been taken up with enthusiasm by the neopagan movement. In addition, Graves followed the BLNFS order of ogham letters put forward by Macalister (see above), with the result that this has been taken up by New Age and Neopagan writers as the 'correct' order of the letters, despite its rejection by scholars. The main use of ogham by modern Druids, Neo-Pagans is for the purpose of divination. Divination by using ogham symbols is mentioned in Tochmarc Étaíne, a tale in the Irish Mythological Cycle. In the story, druid Dalan takes four wands of yew, and writes ogham letters upon them. Then he uses the tools for divination. The tale doesn't explain further how the sticks are handled or interpreted. Another method requires a cloth marked out with Finn's Window. A person selects some sticks randomly, throws them on the cloth, and then looks both at the symbols and where they fell. The divinatory meanings are usually based on the tree ogham, rather than the kennings of the Bríatharogam. Each letter is associated with a tree or other plant, and meanings are derived from them. Robert Graves' book The White Goddess has been a major influence on assigning divinatory meanings for ogham. Some reconstructionists of Druidic ways use Briatharogam kennings as a basis for divinatory meanings in ogham divination. The three sets of kennings can be separated into Past-Present-Future or Land-Sea-Sky groupings in such systems, but other organising structures are used, as well. Coelbren y Beirdd A similar runic alphabet based on the celtic vigesimal system invented by Iolo Morganwg for the Welsh language. ^ "BabelStone: The Ogham Stones of Scotland". 8 June 2013. ^ McManus (1991) is aware of a total of 382 orthodox inscriptions. The later scholastic inscriptions have no definite endpoint and continue into the Middle Irish and even Modern Irish periods, and record also names in other languages, such as Old Norse, (Old) Welsh, Latin and possibly Pictish. See Forsyth, K.; "Abstract: The Three Writing Systems of the Picts." in Black et al. Celtic Connections: Proceedings of the Tenth International Congress of Celtic Studies, Vol. 1. East Linton: Tuckwell Press (1999), p. 508; Richard A. V. Cox, The Language of the Ogam Inscriptions of Scotland, Dept. of Celtic, Aberdeen University ISBN 0-9523911-3-9 ; See also The New Companion to the Literature of Wales, by Meic Stephens, p. 540. ^ Macalister, R. A. Stewart, The Secret Languages of Ireland reprinted by Craobh Rua Books, Armagh 1997. ^ Ross, Anne (1972). Everyday Life of the Pagan Celts. London: Carousel. p. 168. ISBN 0 552 54021 8. ^ Dillon, Myles; Chadwick, Nora (1973). The Celtic Realms. London: Cardinal. p. 258. ISBN 0 351 15808 1. ^ The Secret Languages of Ireland as above. ^ Thurneysen, Rudolf A Grammar of Old Irish. Dublin Institute for Advanced Studies. 1980, etc. pp. 8–11. ^ Ryan, Catriona (2012). Border States in the Work of Tom Mac Intyre: A Paleo-Postmodern Perspective. Cambridge Scholars. Retrieved 16 January 2019. ^ Ryan. Border States. pp. 204–205. ^ Thurneysen, R. A Grammar of Old Irish pages 9–10: "... In Britain ... most of these inscriptions are bilingual, with a Latin version accompanying the Ogam". Macalister, The Secret Languages of Ireland p. 19: "The reader has only to jot down a few sentences in this alphabet to convince himself that it can never have been used for any extended literary purpose." ^ Vendryès 'L'écriture ogamique et ses origines' Études Celtiques, 4, pp. 110–113, 1941; Thurneysen, 'Zum ogam' Beiträge zur Geschichte der deutschen Sprache und Literatur, pp. 196–197, 1937. Cf. McManus 1988, p. 11, 1991. ^ McManus 1988, pp. 36, 167, 1991; B. Ó Cuív, "Irish words for Alphabet", Eriu 31, p. 101. There is also the fact that it would be impossible to change the order of letters in ogham, given that it is a numbered series of strokes. In other words, to change N from the third to the fifth letter would also mean changing its symbol from three strokes to five strokes. The letters F and S would also have to be changed. This would obviously lead to great confusion, and would only be done if there was some compelling reason for the change. Macalister provides no such reason. ^ The rationale for the artificial form Idad would be to make a pairing with Edad. With regard to Ailm, in the King and Hermit poem the hermit Marban says caine ailmi ardom-peitet – 'beautiful are the pines that make music for me' This is a reference to the idea that pine makes a pleasing, soothing sound as the wind passes through its needles. ^ Lewis-Highcorrell, Don (2003). Witch School Second Degree: Lessons in the Correllian Traditio. Woodbury, MN: Llewellyn. p. 135. Retrieved 16 January 2016. ^ The Order of Bards Ovates & Druids. "What Is an Ovate?". Retrieved 19 January 2007. ^ Somerset Pagans. "Ogham". Retrieved 19 January 2007. ^ a b Philip Shallcrass. "A Little History of Ogham". The British Druid Order. Archived from the original on 4 April 2005. Retrieved 28 April 2010. ^ Searles O'Dubhain. "Druids, Ogham and Divination". Retrieved 19 January 2007. ^ "Center of the Grove". Retrieved 19 January 2007. ^ O'Dubhain, Searles, Ogham Divination Course, The Journal of the Henge of Keltria (1995–1998) "Keltria Back Issues". and offered online in the Summerlands (1995–2007) "Ogham Divination Course". O'Brien, Michael A., ed. (1962). Corpus Genealogiarum Hiberniae. 1. Kelleher, John V. (intro. in the reprints of 1976 and 2005). Dublin: DIAS. ISBN 0901282316. OCLC 56540733. Ranke-Graves, Robert von. Die Weisse Göttin: Sprache des Mythos (The White Goddess), ISBN 978-3-499-55416-2 OCLC 52100148, several re-editions, but rarely available. Editions available in German and English. Thurneysen, Rudolf. Zum Ogam, Beiträge zur Geschichte der deutschen Sprache und Literatur, 61 (1937), pp. 188–208. Vendryès, Joseph. L'écriture ogamique et ses origines Études Celtiques, 4 (1941), pp. 83–116. This page was last edited on 14 April 2019, at 13:14 (UTC).